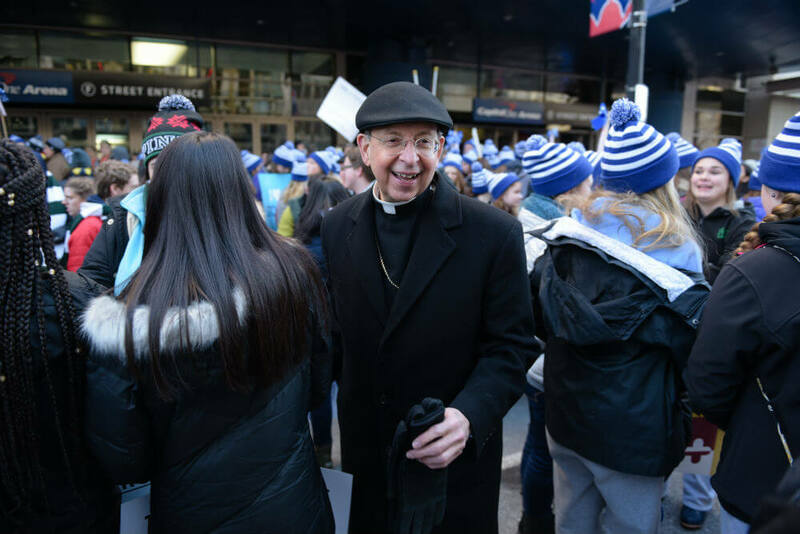 WASHINGTON, D.C. – Young people from the Archdiocese of Baltimore filled multiple sections of the Capital One Arena in the nation’s capital early on the morning of Jan. 19 for the Mass for Life, which kicks off the annual March for Life. 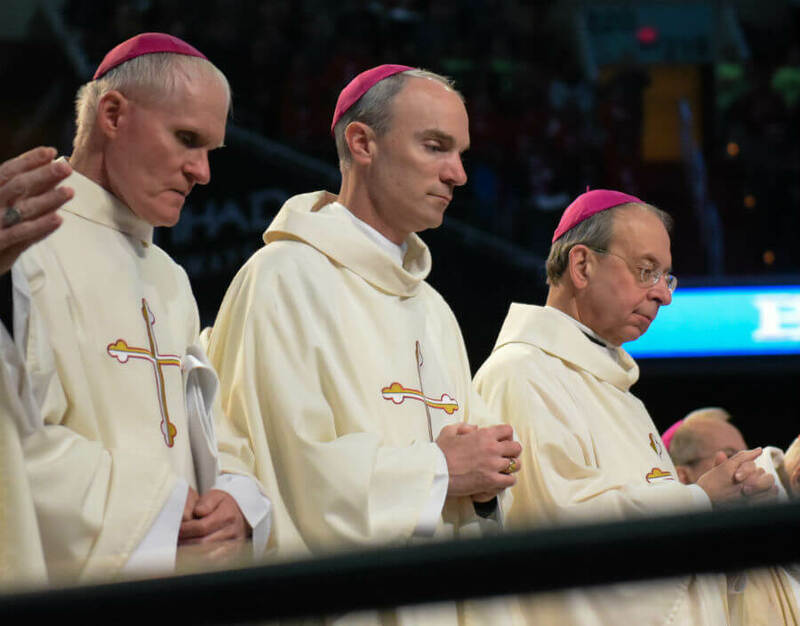 Those sections erupted in applause as Cardinal Donald Wuerl, Archbishop of Washington and principal celebrant, read off the names of concelebrants Archbishop William E. Lori, and auxiliary Bishops Adam J. Parker and Mark E. Brennan. The day marked the one-year anniversary of the episcopal ordinatons of Bishops Parker and Brennan. Young people from around the nation occupied the remaining seats in the arena best known as the home of NBA and NHL teams. The morning began with a Youth Rally, which featured artists such as Emily Wilson and Out of the Darkness, along with group prayers led by students of local schools. 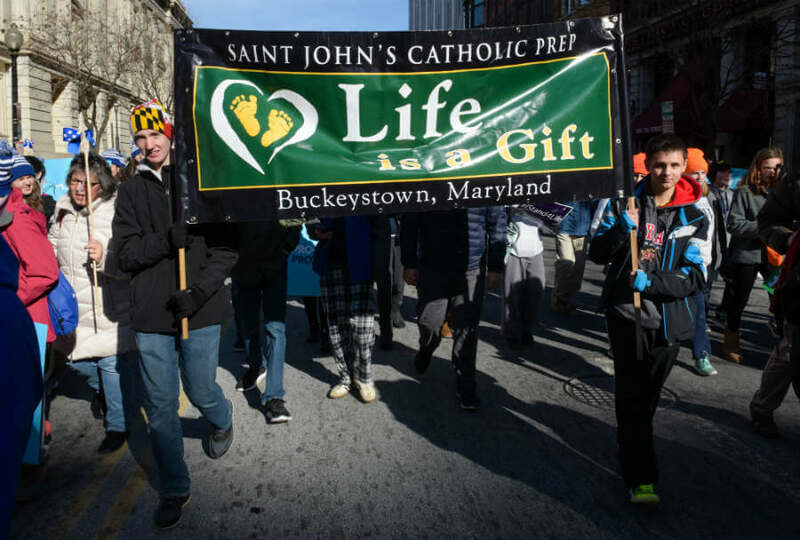 Catholics from each county in the archdiocese joined the estimated 100,000 pro-lifers who then gathered on the National Mall near the Washington Monument for the 44th annual effort. Throughout the day, the presence of the Baltimore Archdiocese was seen and heard. St. Peter the Apostle in Oakland parishioners Colleen O’Brien, 19, and her sister Catherine, 17, have been coming to the March for Life with their family for years. “Anyone’s presence fuels the movement,” said Catherine, a student at South Garrett High School. Faced with a three-and-a-half hour from Maryland’s westernmost county, the sisters traveled the previous night with their mother and another parishioner and stayed with a relative. Chaperones guided 12 students from St. Thomas More Academy in Middletown from the Shady Grove Metro Station to the Capital One Arena. The Frederick County school closed to allow students the opportunity to attend the Mass and march with either the school-sponsored group, or with their families. “We need to respect even the littlest (people),” said Laura Neumark, 13, an eighth-grader. Enzo Leone, a 15-year-old student at Mount St. Joseph High School in Baltimore, cited his strong faith background as a reason he attended with the youth group from his parish, Our Lady of the Fields in Millersville. Kathleen Jauschnegg, Leone’s youth and young adult minister, brought a group of eight that ranged in age from 15 to 19. While the youth group used public transit to make their way to the morning Mass, busses from Our Lady of the Fields brought others to the March for Life. Included were twins Anna and Michael Dodd, 10, along with their mother, Christine, parishioners of St. Joseph in Odenton. Christine has kept herself and her four children active in pro-life causes. In addition to participating in 40 Days for Life and praying outside of abortion clinics, the family is active politically. A few years ago, Anna and Michael helped distribute postcards to lawmakers in Washington promoting life. Sister Joan of Arc is a member of the social science department at Mount de Sales Academy, which bused 250 students from its Catonsville campus. With approximately 50 chaperones, the group’s total was nearly 300. The group gathered at 4:45 a.m. for their departure. “We’re given such an amazing gift from God – life,” said Mary Bartlinski, another tenth-grader. A rally that began at noon at the Washington Monument that included music and speakers, including President Donald J. Trump via a live satellite broadcast. The march to the Supreme Court began at 1 p.m. 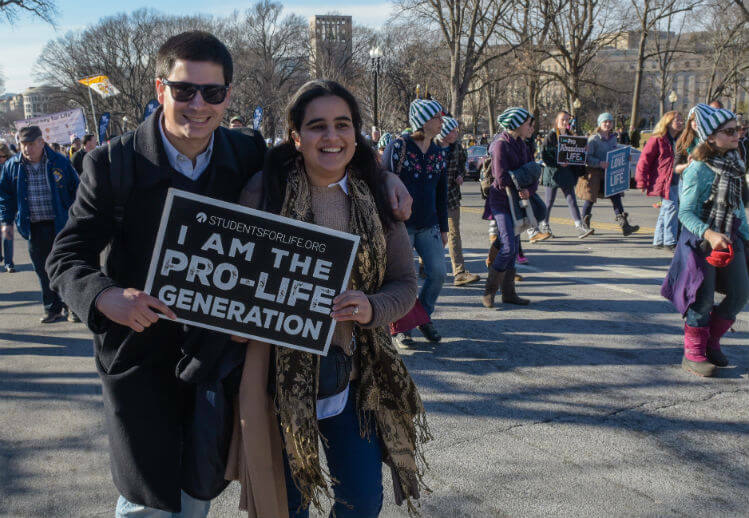 Following the march, attendees were able to visit with their representatives and promote the respect life cause – from conception until natural death. Sparks residents and Church of the Nativity in Towson parishioners Paul and Debbie Gurny were in their eighth march. Leonor Castel-Branco is living in Baltimore City on a visa while her husband completes his doctorate. The couple intend to move back to their native Portugal. In the meantime, they have joined the Basilica of the Assumption of the Blessed Virgin Mary community. Even though they are not eligible to vote, Leonor and her husband decided to march. 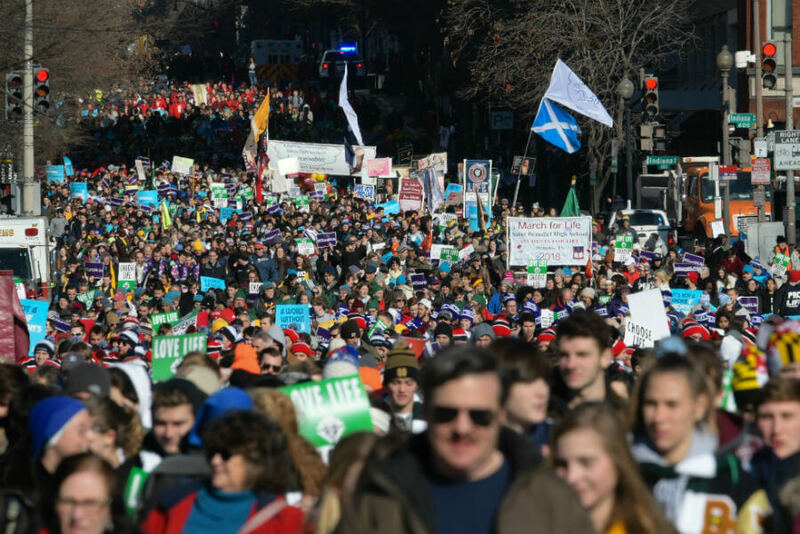 They attended the March for Life in their home country, but always heard about the one held in Washington. A parishioner of St. Joseph in Cockeysville attended the march for his first time. An undocumented immigrant from Guatemala, he requested that his name not be shared. For four years, he has been going back and forth between the U.S. and Guatemala, where he has a wife and daughter, and his wife’s two children, to support. He has faith that he will find a way to stay in the U.S., to provide a better future for the children. He chose St. Joseph because he identifies with the church’s patron saint. He said that the parish is a way for him to cope with the invalidity that he feels as an undocumented immigrant. Attending the march gave him the opportunity to take information about what is happening in the U.S. back to Guatemala. He was amazed at the amount of people who showed up to support the cause. St. Ursula in Parkville has sponsored a bus to the march for 15 years. This year, it carried veteran marchers, first-timers and a group from the Catholic Campus Ministry at Towson University. 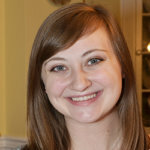 Joy Stephanie Telan, a senior at Towson focusing in deaf studies, joined Catholic Campus Ministry in the fall of 2015. She first discovered American Sign Language in high school, from a friend, because she is hard of hearing. Telan, a parishioner of St. Mary’s in Annapolis, came to the U.S. from the Philippines with her mother and brother when she was eight. Trish lost eight children to miscarriage. She said that the medical term used for a miscarriage, spontaneous abortion, upsets her and she would like to see it changed. Trish described the pain that she felt while she was in the hospital following her miscarriages, and seeing other women who were having abortions. She wanted her babies to live. She and her husband, Glenn, have three sons. One, heartbreakingly, was murdered. Glenn said that they have hope that the laws allowing abortion will change. For more photos, visit our Smugmug page here.